Thomas Jett, a lifelong resident of Mexico Beach, Florida, drives his heavy duty truck through what used to be the downtown of his hometown. The camera filming him shows destruction everywhere, outside his windows and in the reflection on his mirrored sunglasses. For a moment he is at a loss for words as he talks to the Washington Post reporter riding with him. He says to The Washington Post (2018) “I’m 48 years old and I’ve never…” He pauses. “I can’t even dream of something this bad.” Mexico Beach was destroyed by Hurricane Michael on October 10th, 2018. Images like those taken of Jett’s hometown, showing crumbled houses spilling into streets and FEMA authorities climbing over debris, are becoming an annual part of the news. They will become even more common. The threat of hurricanes to American coastal communities is increasing, because climate change is causing hurricane intensity and frequency to increase (Gutmann et al, 2018). United States coastal communities should invest in salt marshes as a form sustainable green infrastructure to mitigate damage from hurricanes. Hurricanes can cause severe damage to houses near or on the coast (Mousavi et al, 2011). Unfortunately many people have houses on the coast, whether they live there full time or just vacation there. According to recent data, there is currently, 2.5 billion people or around 40% of the world’s population living within 100 km of the coast, which adds more pressure to coastal ecosystems (Reef Resilience Network, 2018). The damage caused by hurricanes causes many families to have to completely relocate and abandon their homes, or causes families to spend thousands on rebuilding their homes (Pulver, 2018). Hurricanes are severely affecting the people living by the coast. Just recently, last year, hurricane Irma caused around 53 billion dollars in damages to Florida and 129 fatalities (Pulver, 2018). It was the first category 4 hurricane in a long time for Florida residents. A new record of 6.5 million people in Florida had been evacuated. Just in one county of Florida, Clay County, 275 homes were destroyed (Stepzinski, 2017). In just this one county, they suffered around 40 million dollars in damages. Not only was hurricane Irma extremely detrimental to floridians, hurricane Isabel back in 2003 exceeded the record for storm surge in D.C. and was one of the most detrimental hurricanes, affecting multiple coastal regions (Ambrose, 2018). Some of those coastal regions being, North carolina, West virginia, Virginia, and into Pennsylvania, which caused over 5 billion in damages, mainly caused by storm surge and flooding (Ambrose, 2018). The governor in Virginia stated that it was the worst storm he had seen in a generation (Ambrose, 2018). There was extreme tree loss and tree damage from the flood waters. Many of these trees landed on houses and cars, creating an even larger amount of damage (Ambrose, 2018). From just Hurricane Isabel, the flooding it caused in Washington D.C. went beyond the record set by the Potomac-Chesapeake Hurricane (Ambrose, 2018). As a result of increased levels of CO2 the intensity of storm surge during hurricanes will continue to increase. (Lin et al, 2017). As the global climate gets warmer the oceans begin to warm too. As more and more landlocked ice melts and raises sea levels that eventually become warm as well, more ocean water is available to be washed up on shore in the event of a hurricane. Additionally, a warmer more humid climate makes way for more storms that bring the newly melted sea water up to shore up to 22.7% more frequently in the event of a 2 degree raise in surface temperature 0.3 meters down (Mousavi et al, 2011). Climate change is affecting the already large threat of hurricanes in the United States. It is clear that increases in atmospheric CO2 causing changes in climate have positive correlations with hurricane frequency. According to future predictions, hurricane frequency will continue to increase for years to come. The current average hurricane storm frequency is 0.71 worldwide. The average over oceans is 0.76 and the average over land is 0.57 (Good et al, 2016). Using a exponential model, the frequency of hurricanes can be predicted for the future. In the model, the variability in storm frequency is identified as the smallest of three components, being 14% variable over oceans and 25% variable over land. These results were identical to the results determining storm frequency at the daily scale (Lin et al, 2017). In a future prediction, half of the projected sea surface temperatures produce an increase of frequency (Held I. M., 2010). Although all the sources provided differing results, the conclusions are the same for each source. Sources agree that frequency of hurricanes will increase over time. To protect coastal cities from hurricanes, state governments must invest in green infrastructure, specifically in restoring salt marshes. Salt marshes mitigate storm surge, a destructive aspect of hurricanes, and represent a cost effective hurricanes defense solution compared to other solutions. Communities should look to Louisiana, which is planning to invest $50 billion over the next 50 years in a statewide coastal restoration project (PRI, 2015). The plan involves water diversion to mimic the way the Mississippi River builds the river delta. Boats will dredge sediment out of the river and pumped into now-flooded basins to turn them back into swamps. The plan hopes to restore 33,000 acres of marsh. Total restored area matters, because every 2.7 miles of marsh reduces storm surge height by 1 foot (Weather Underground, 2016). Researchers found that by absorbing storm surge, wetlands avoided $625 million in direct flood property damages during Hurricane Sandy (Narayan et al, 2017). The same study indicated a 16% average reduction in annual flood losses because of salt marshes. Unfortunately, salt marshes in many coastal areas are disappearing or are gone. In coastal New England, population growth and urban development rates skyrocketed beginning in the 1970s due to increasing real estate value, and by 2004 25% of all New England coastal watershed land area was developed (New Hampshire Department of Environmental Services, 2004). Just one road can eliminate huge areas of marsh. For over 300 years, humans have been building roads and rail lines cutting through American salt marshes. Roads divide salt marshes into two sections, one with access to the sea and one without. The sections without cannot be restored by regular tidal flooding and die (New Hampshire Department of Environmental Services, 2004). Dead salt marshes should be restored. Restoring salt marshes is a good investment for coastal communities, because they reduce storm surge height and save communities huge sums of money in prevented losses. Before we can hope to understand the ways in which salt marsh restoration can prevent damage done by hurricanes we must first get a grasp on what exactly a salt marsh is. A salt marsh is an area in coastal ecosystems that can trap in a large volume of liquid within the soil due to its high uptake ability (Harvey et. al 2015). They act like massive sponges. After the exact definition becomes clear, its applications for hurricane prevention become a bit less foggy as well. Only one question remains; how do salt marshes not only trap water but prevent millions of dollars worth of damage during a natural disaster? This question was asked and researched about in 2012 during Hurricane Sandy when coastal developments suffered over $62 billion in damages (Narayan et. al 2018). 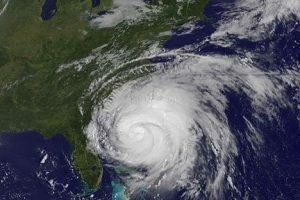 After the events of Sandy, researchers from South Carolina gathered data and found that areas that were set back behind salt marshes were significantly less damaged by the hurricane. Salt marsh wetlands were responsible for saving over $625 million in damages spanning the coasts from Maine to South Carolina. This means marshes prevented the equivalent of 11% of the total damage done by Sandy (Siddharth et. al 2018). If more states invested in the conservation of these marshes rather than developing over them for annual commerce, then Sandy would have caused 25% less damage (Siddharth et. al 2018). In Maryland alone, a state funded salt marsh restoration project mitigated 30% of damage costs. The next step is to incentivize state and national funding for restoration projects. The researchers from South Carolina put it best stating “Homeowners and municipalities could receive reductions on insurance premiums for managing wetlands. Post-storm spending should include more support for this natural infrastructure. And new financial tools such as resilience bonds, which incentivize investments in measures that reduce risk, could support wetland restoration efforts too” (Narayan et. al 2018). Some cities are less interested in green solutions and more interested in “grey infrastructure,” such as concrete barriers. There is popular support in Galveston, Texas for an “Ike Dike” (named for Hurricane Ike), a proposed massive concrete barrier meant to shield the city and neighboring Houston (Texas A&M University Galveston Campus, 2017). Galveston officials are inspired by the Dutch, who built a “coastal spine” after the 1953 storm surge disaster in the Netherlands (Texas A&M University Galveston Campus, 2017). Galveston is not the only U.S. community inspired by the Dutch. The U.S. Army Corps of Engineers recently proposed building a $20 billion barrier stretching more than 2,150 square miles to protect New York and New Jersey (AP News, 2018). Boston recently published a city report suggesting a Boston harbor barrier (The Boston Globe, 2017). None of these cities should build a massive concrete and steel harbor barrier. They are not the silver bullet solutions that they seem to be. Harbor barriers protect coastlines, but at huge costs to local ecosystems and economies. In a report about a proposed harbor barrier, the New York City Economic Development Corporation acknowledged that a barrier on the Hudson River would disrupt fish migration, siltation, river flow, and water quality (NYCEDC, 2013). The harbor barrier would damage the local fish population, which would also hurt the local fishing industry. A recent University of Massachusetts Boston report found that a grey harbor barrier would be less cost effective that green infrastructure solutions. Benefit:cost ratios of recently designed shore-based green solutions are between 3.22 and 5.3. Benefit:cost ratios of a harbor barrier are between 0.05 and 1.69, with most ratios being well less than 1.0. (UMass Boston Sustainable Solutions Lab, 2018). Most of these estimates put the costs of a harbor barrier as greater than the benefits. All estimates put the costs of green shore-based solutions as less than the benefits. During Hurricane Irene, North Carolina properties that used salt marshes as natural shoreline protection measures withstood wind and storm surge better than properties using seawalls or bulkheads (NOAA, 2017). Harbor barriers, like any grey infrastructure project, require upkeep and repairs as they get older. Salt marshes take care of themselves. Storms and the flooding associated with them flood salt marshes. Salt marshes catch sediments carried by floods, raising soil levels by a few centimeters per storm, allowing salt marshes to keep up with sea level rise (U.S. Geological Survey, 2010). United State coastal communities should invest in “green infrastructure” over “grey infrastructure,” because green salt marshes protects communities while also protecting ecological and green economic activity. As more landlocked ice continues to melt due to green houses gases in the atmosphere raising global temperatures. As a result, sea levels will continue to rise intensifying the effects of storm surge as well as precipitation increase on a global scale (Harvey, 2015). Most estimates predict we can expect to see a rise of about 1.25 feet in the next 30 years (GlobalChange.gov, 2018). Increasing sea levels will cause damage totals to increase in coastal regions and due to this, individuals who live on the coast will be heavily impacted by hurricanes. In the united states alone, over 39 percent of the population lives in cities only a few miles from the coast. Almost 14 million Americans (NOAA, 2013). The effects of intense and frequent hurricanes don’t end with those who live in coastal regions. As the damage done by hurricanes increases, it will force people off the coast and into more landlocked cities that eventually will become too densely populated (Douglas, 2017). As it is, over 66 million people live in the central United States. There is not enough land to support coastal residents all moving inland (NOAA, 2013). These damages will affect the lower income residents of coastal cities because they often don’t have the money or the proper insurance to repair their homes (Douglas, 2018). Hurricane frequency and intensity affect everyone in the United States in one way or another and for that reason a shift in policy and practice are key to protecting those susceptible. Policy makers need to be aware of these issues as well. In order for buffers to be in place such as salt marshes to be put in place lawmakers need to allocate funds to these projects (Harvey, 2015). In regards to Hurricanes, it is well represented through all the available data that even land human residents far from land will be affected by the damage that they bring in one way or another. Whether or not an individual lives on the coast is not the deciding factor of if they will be affected but instead its how much (NOAA, 2017). In the next decade or so we can expect to see a substantial increase in sea level rise. Policy is the best way to mitigate these risks but making these sort of changes are often too slow and require years if not decades of lobbying. The best way to stop these hurricanes for now, is to not stop them at all but to better prepare. States need to allocate funds to repairing natural buffer zones such as salt marshes in order to create natural barriers to hurricane damage. They function better than man made cement walls and cost less too. On average they prevent the damage caused by hurricanes by about 16 percent (Texas A&M University Galveston Campus, 2017). If we implement these strategies now or at least begin to get the ball rolling, we have our best shot at keeping not only coastal residents safe, but everyone who will feel the ripple effects of these natural disasters (Harvey, 2015). Global Climate Change .Gov. “Projected Sea Level Rise and Flooding by 2050.” GlobalChange.gov, 2018, www.globalchange.gov/browse/multimedia/projected -sea-level-rise-and-flooding-2050. Harvey, Chelsea. “Sea-Level Rise Will Cause More than Flooding – These 5 Other Impacts of Rising Oceans Are Just as Bad.” Business Insider, Business Insider, 17 Feb. 2015, www.businessinsider.com/5-terrifying-impacts-of-rising-sea-levels-2015-2. Main, Douglas. “Climate Change Will Hurt the Poor and Help the Wealthy, Study Says.” Newsweek, 29 June 2017, www.newsweek.com/climate-change-will-hurt-poor-and-help- wealthy-630155. Narayan, Siddharth, and Michael Beck. “As Communities Rebuild after Hurricanes, Study Shows Wetlands Can Significantly Reduce Property Damage.” The Conversation, The Conversation, 19 Sept. 2018, theconversation.com/as-communities-rebuild-after -hurricanes-study-shows- wetlands-can-significantly-reduce-property-damage-83935. US Department of Commerce, NOAA, and National Oceanic and Atmospheric Administration. “What Percentage of the American Population Lives near the Coast?” NOAA’s National Ocean Service, 1 June 2013, oceanservice.noaa.gov/facts/population.html.